You can contact us by phone, fax, letter or email. Our artists have, on average, 15 years of experience and they all have advanced degrees in fine arts. As we have a large team of artists, we employ specialists in certain disciplines and styles. Does 1st Art Gallery have an affiliate program? Of course we do, and we always like to talk to new potential affiliates. For more information contact us and let us know about your affiliate interests. For normal orders, shipping is free to anywhere in the world. If you are a wholesale customer, we have some different options if you wish to buy in bulk. It's free even to me? I live in _____. Yes, even there. The shipping charges are included in our painting's price to any location in the world that FedEx, UPS or DHL will deliver to. How do you ship paintings? We only use reputable carriers like FedEx, DHL or UPS. We ship unframed paintings in a protective, hard plastic tube. What if my painting is damaged during shipping? In the very rare case that your painting arrives damaged, please refuse the delivery so we can receive the package back from the shipping company and claim the insurance funds. We will then paint a new painting for you and will ship it to you within 10 days. This extremely rare circumstance does not constitute a reason for a refund as the damage is the responsibility of the shipping company and as we will paint for you a new painting for absolutely free. Since shipping is free, does that cover customs or taxes? As with most purchases, paying any local customs or taxes is the customer's responsibility. However, it has been our experience that 95% of the paintings arrive untaxed. Do you sell paintings or prints? We only sell 100% handmade oil paintings, hand painted by experienced artists. These are oil on canvas genuine masterpieces and each stroke, texture and nuance is created by hand - in the same way the original paintings were created. We use no printing, pressing or technological tricks to create our paintings. Yes - by default our paintings are signed by the artist. However, if you like, you can request us not to sign it. Can I purchase original art from you as well? We hope to add more original pieces to our collection, but we can create original paintings from your photographs. Here's more about our portrait services. How long before I receive the painting? Between four and five weeks. Since painting with oil on canvas is a complicated, time-consuming process, our artists will spend between 20-25 business days creating your masterpiece. If your painting is much larger, or if is extremely complex, the artist spend a bit more time with it. After you've approved the painting, we'll ship it to you immediately. Shipping can take three to four days. When you order your painting, we'll send you a detailed timeline that shows when you'll see a sample and when you'll receive your painting. What's the biggest size I can order? As you'll see on our order form, our largest paintings are 120 inches by 120 Inches (3 meters by 3 meters). However, if you have a special request, our artists can work on even much larger canvases - there is no limit. Most of your sizes are similar height:width ratios. Can I order something different? Yes. You can request paintings in any size you want. Some customers like to follow the painting's original aspect ratio, keeping the original relation between the painting's length and width. If the size you need does not match the painting's original aspect ratio our experienced artists will extend or reduce some of the painting's background to achieve the best possible result. We can also reproduce detail paintings of a larger original, e.g. Mona Lisa's smile, or a part of the Sistine Chapel. Our artists are very flexible and there is not limit. Just let us know what you want. I have a photograph. Can you paint it? Of course. Every day, we create original pieces from photographs that our customers provide. We produce portraits, recreate wedding photos and even paint beloved family pets. Here's more about our portrait services. My original photo is blurry. Can I send more than one photo for detail? 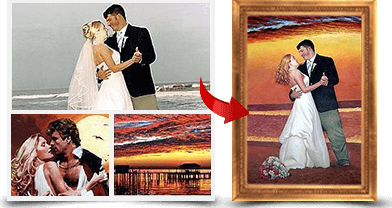 Yes, we have experience adding detail to a painting from multiple photographs. Perhaps it's detail for a family crest, the writing on a sweatshirt or just a hairstyle. Our artists can use the details that you provide to make your painting capture even more details than the original photograph did. Can you add color to a black and white photograph? Yes. That's a frequent request from our customers. We can paint color portraits from old black and white photos or damaged photos and can even provide some color correction. Can I send a painting my dad made to be reproduced? Of course. All we need it a quality photograph of it and our artists can reproduce it. Can you create a new oil painting from a bunch of different photos? Definitely. It's called a composite painting. Since our artists start from scratch there is no limit to what they can add to or subtract from the original photos. An example could be a family portrait with an additional person, a different background or a photograph painted in the style of a particular artist. As far as composites go, the only limit is your imagination. Here's a detailed description of compositing along with some samples. How can I pay for my painting? You can pay for your painting with a credit card, PayPal, or money order. For large orders, we'll accept a bank wire. We accept payments through our secured payment page, by phone or by fax. Can I pay by credit card? Is it secure? As with any reputable art gallery or Internet eCommerce vendor, we make all credit card transactions via a secured, bank-authorized credit card processing company and through a 256 bit SSL encrypted and secured Web page. No person will see your credit card information as it is all done electronically. We also do not keep your credit card number on file. As an added level of security, all purchases are guaranteed by both your credit card and our processing company. When I buy a portrait, what am I paying for? You're purchasing the portrait and everything that goes into it along with our costs to ship it to you. All costs such as insurance and fees are included and you won't be asked to pay anything else. Can I see the painting before you ship it? Of course. If requested by you during checkout, we will email you a digital photograph of the painting. You can look at the image and ask for revisions or approve the image for shipping. Do I pay upfront for the painting or when I receive it? You pay when you place your order with us. Before we begin working on your painting, we need to know that you have the means to pay for it. All online transactions work this way, and keep in mind that all paintings ordered from 1st Art Gallery are backed by our 100% money back guarantee. Yes, in fact we offer many. The first guarantee happens when, if requested by you during checkout, we email you a photo of your painting. Our guarantee is that we'll revise this painting until it meets your expectations. 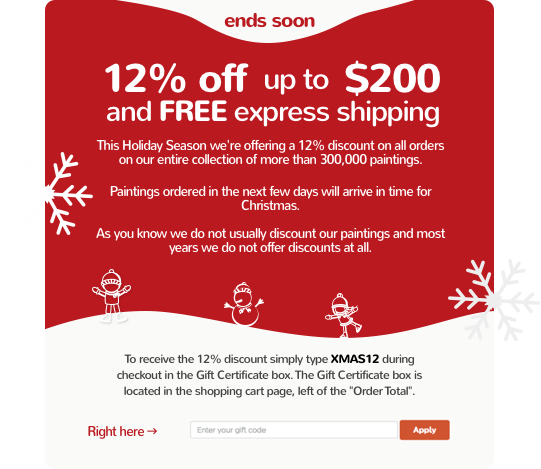 Our second guarantee is when you receive the painting; you are free to return it for more revisions or else for a full refund minus our actual shipping cost -- which is, on average, $25 per painting. Please note that portraits cannot be returned if they have been approved by the customer prior to their dispatch. Our return policy is valid for 365 days and the return period is from the merchandise arrival date and is not valid for custom orders. The money back guarantee is not transferable to 3rd parties, you cannot order a painting for someone else only to "discover" that he is not interested. Can I return a painting? Even after approving the initial emailed photos of the painting (excluding portraits), if you're unhappy with the painting, you can return it to us for revisions. In the unlikely case that we cannot improve it to your satisfaction, we will refund you minus our actual shipping cost. We do ask however that the revisions you request not conflict with the original direction that you gave our artists. You may ask for revisions until the painting meets your expectations. How do I return a painting? It is compulsory to contact us before returning a painting and await exact return instructions. Our actual shipping cost will be deducted from the refund. Returned merchandise must be wrapped & packed in the original tube and send to the address of origin. Merchandise must be returned as instructed. Failure to follow these instructions may result in a penalty of up to $75.00 per painting.